Home » ★★☆☆☆ » Maxelâ. Stick to the steak. Maxelâ. Stick to the steak. We’d booked. There was no need. I’d dragged myself off my sickbed to go out to eat. I was fed up with the view from my bedroom window, but I didn’t want to do or eat anything too challenging. I know. Shocker. I’d read Marina O’Loughlin’s review at the weekend and I thought that a slab of pure protein might do me some good. Some good plain cooking might lift my spirits and I knew that C, being North American, would never say no to the possibility of a good chunk of cow. I knew from the review what to expect. But I didn’t expect to be freezing cold, to the point I needed to put my coat on. I didn’t expect that we would be the only diners, for the entirety of our meal. I didn’t expect a soundtrack of hits of the 80’s I never wanted to hear again, reverberating round an empty restaurant. It’s good to know that I still hate Dire Straits. On the left, as you walk in, a chiller cabinet with large bits of carcass. 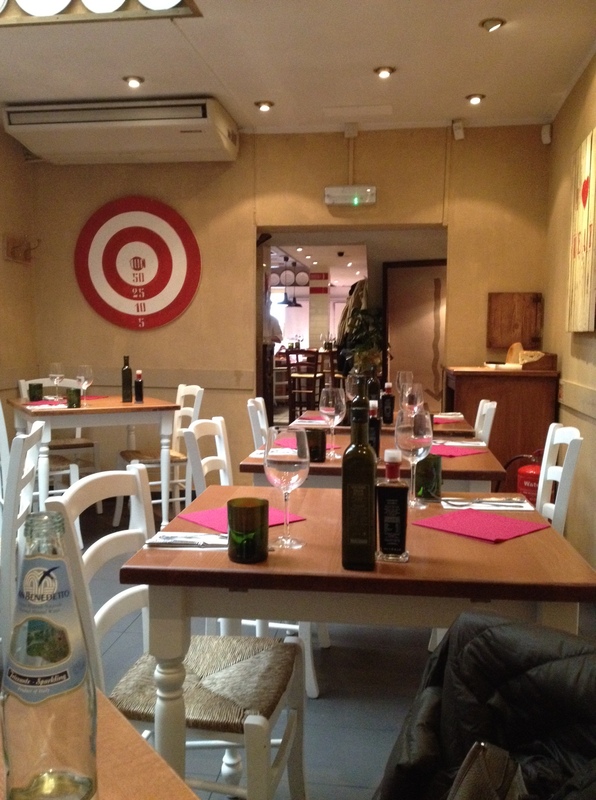 Part butcher, part restaurant, this isn’t the place to bring vegetarians. Or those who don’t like to face they fact that they are about to partake of a dead animal. Some serviceable focaccia was brought to the table, to be eaten with reasonable olive oil and balsamic. 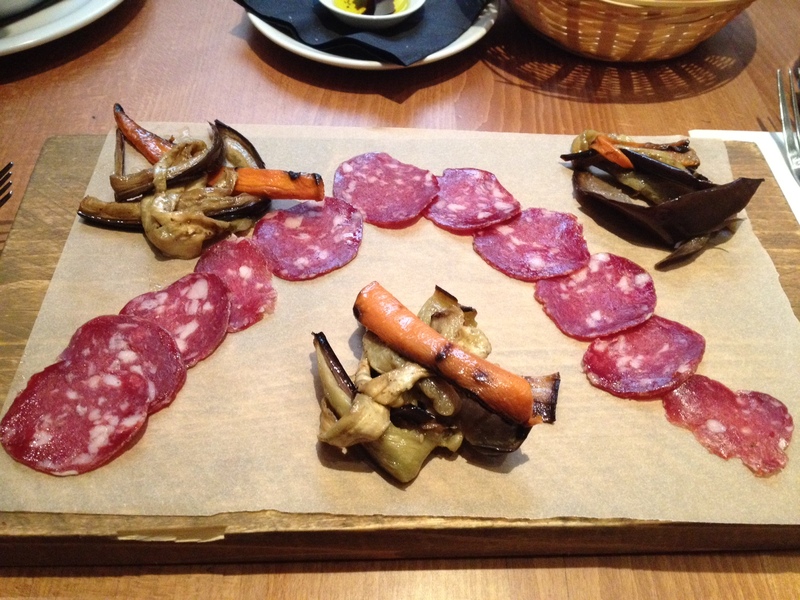 Not wanting to dive straight into the steak, I chose to start with salami and grilled vegetables. C ordered minestrone. The salami was fine. Not a massive amount, but pleasant. The grilled vegetables needed salt, though. None on the table. By the time I’d managed to grab the waiter’s attention, I’d finished. Oh. C pronounced the minestrone amongst the very worst he had eaten. And coming, as he does, from London, Ontario, that is saying something. I had a taste. It was a green, oily sludge of vegetables. Overcooked to stringy, slimy oblivion, swimming in oil, and lacking in any discernible flavour. Do they have a problem with salt and pepper? None on the table and certainly no evidence of its use in the kitchen. And then the misunderstanding over the size of the steak. A problem in the translation. The one they brought to the table to show us was big enough for one person only. Even C was moved to run after them and tell them it wasn’t big enough and he never complains. And why would he, when he has me? But I was not on form. Not that it stopped me from asking them to turn the music down. I had to, before my ears bled. It’s for the staff, C said. Yes. To stop them feeling lonely, I imagine. And the staff were really nice and helpful. Wanting to know that everything was ok and trying really hard. I could have been honest about the soup, but really, there was no point and I didn’t have the heart. Food other than meat is clearly not their forté. 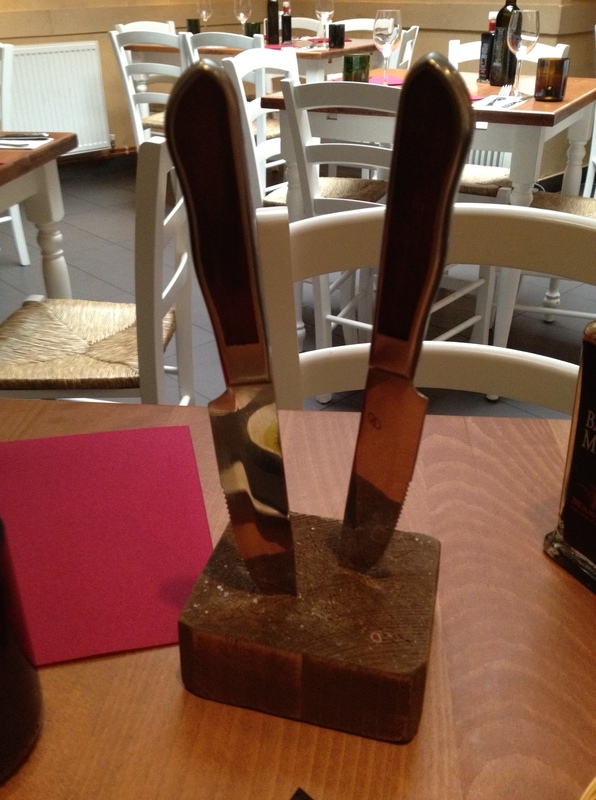 Before the meat arrived, two knives delivered to the table with a flourish, stuck into a small plinth. I was thinking that might work well in my office. There are times when to point to a knife would simply be easier. But we digress. The meat. The meat itself was actually delicious. 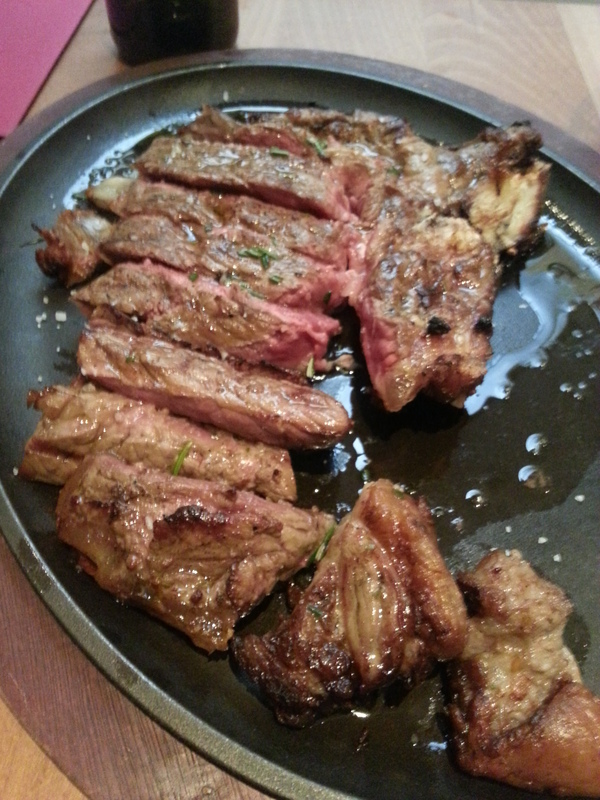 A large T-Bone steak, alla Fiorentina, cooked exactly as requested, with rosemary and garlic. C said he preferred it a little more charred, but I really liked it as it was. Good flavour and texture and healthy to boot. The shtick here is the Piedmontese beef. Apparently the meat of this native Piedmontese breed has a particularly low fat content: 0.5-1% compared with 3% of other breeds. You’d think that the lack of fat might impair the flavour, but no. Succulent, tender, tasty it was almost good enough to make me want to go back. But not quite. At least not to eat there, though I might well go and buy some of the delicious meat. And it’s not expensive, for the quality of the meat, compared to other more hip hangouts we could name, but really, they are much more fun than this. And seated at the back of the restaurant, in a hastily-decorated and cold room, the atmosphere was truly, toe-curlingly dreadful. The front of house was much better and I don’t know why we were placed at the back, in splendid isolation. And obviously no restaurant is at its best when empty and we clearly saw it at its worst. I imagine that it is far better in the evening, with a few people there to warm it up and drown out the painful background music. Which was still too loud, even after they had turned it down. And to top it all, I came out to a parking ticket. A single yellow line, on a Bank Holiday. Perfect. If this had sound you would be hearing Karma Chameleon. Twice.